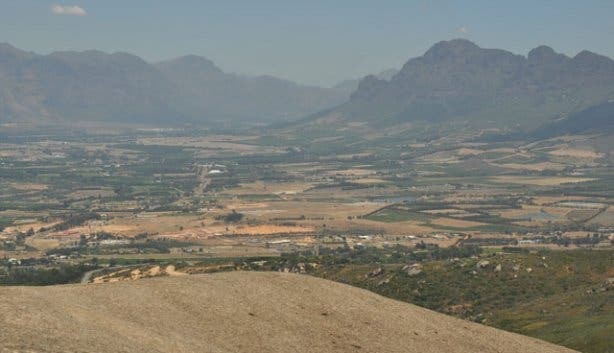 Paarl, the birthplace of Afrikaans, a Mecca for shiraz aficionados, and a playground for nature lovers. 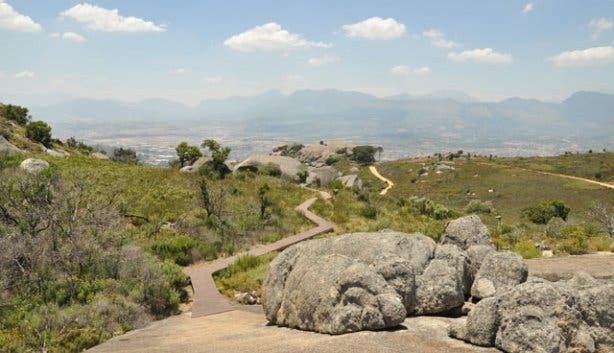 This quintessential winelands town was named after its mountain reserve, but more specifically Paarl Rock itself. 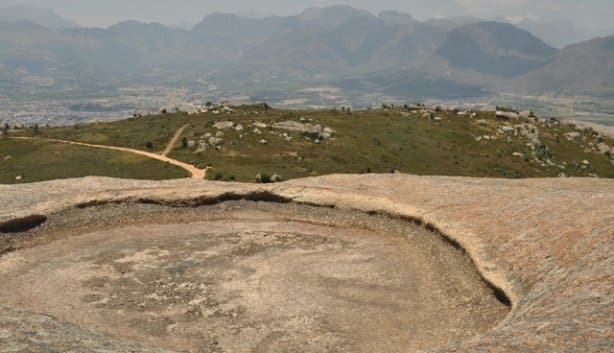 The huge granite rock is formed by three rounded outcrops that make up Paarl Mountain and is the second largest granite outcrop in the world. 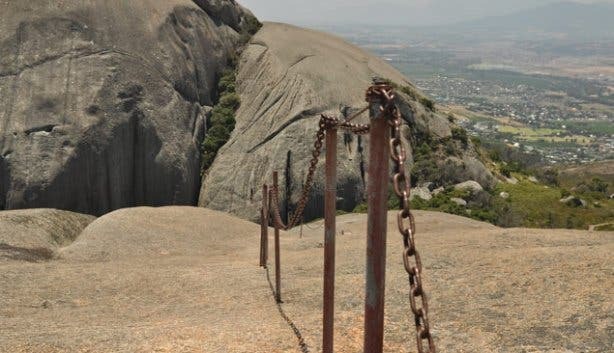 Paarl meaning ‘pearl’ was so named for the pearlescent glitter of wet granite after the rains. It’s not raining today, no; the Boland oven is turned on high. 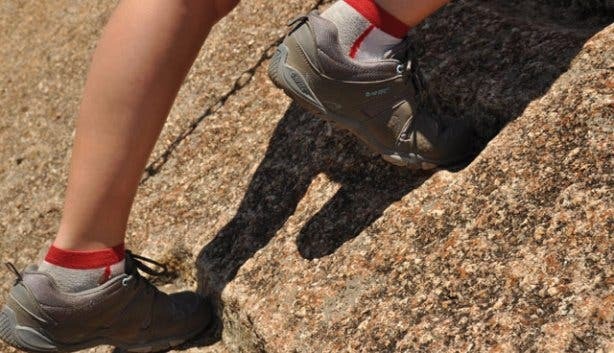 We’ve come prepared—short-shorts, peak caps and our V-Lite Altitude Ultra Luxe WPi Hi-Tecs, which are very much needed to scale Bretagna Rock. Pockmarked with craters like an earthbound moon the granite surface has an alien glitter to it. It really does feel other-worldly; with the indigo sky rocketing above and the Drakensberg Mountains like a hologram in the hazy distance. Hat, sunblock, water. 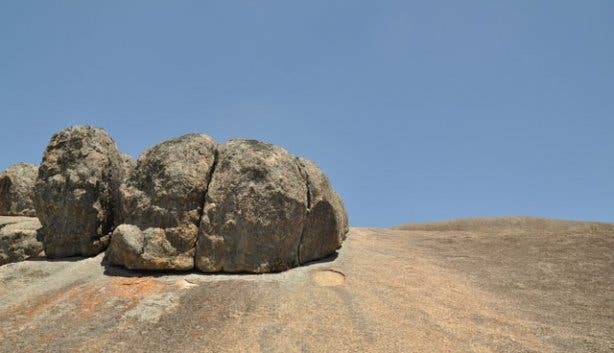 You’re at the mercy of the elements here, exposed on a large granite rock. Screw your hat on tight; generous wind gusts can see you making unintentional offerings. 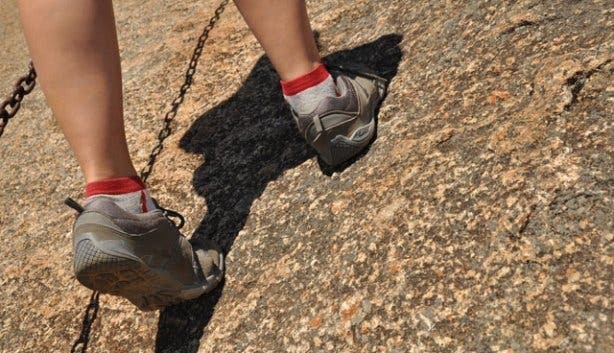 Hiking shoes, the walk is an upward slope, on rock. You’ll need shoes with grip. Picnic; find a crater to call your own. Money, there’s a botanical garden in the reserve should you wish for a frolic in the flowers. Children from walking age up. The walk begins on a recycled plastic path, very much resembling wooden slats—just a bit bouncier. The path splits at the end point; in one direction the glinting rock face, and in the other, a shady path stitched with trees. 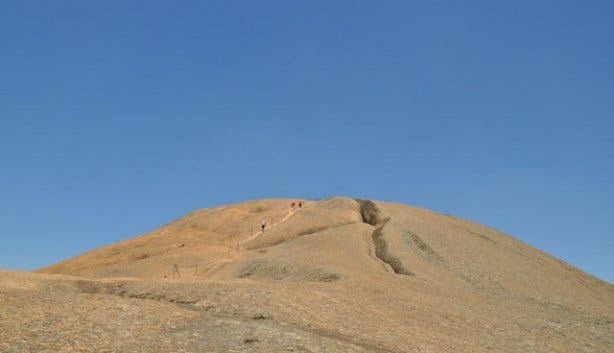 The walk is straight forward and entails: a steep-ish incline up to the chains, from here you grab on tight and pull yourself up the rest of the way. It’s not as extreme as it sounds; in fact it’s quite easy. We even spotted an elderly group making their way up. 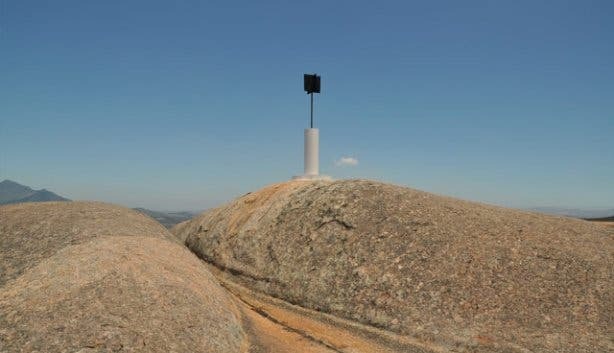 On a clear day, you can see Table Mountain from the top as well as the deep blue of the surrounding dams. Duration: 30 minutes to an hour depending on fitness levels and if you decide to picnic in a crater. There’s a certain magic about this reserve, still quite untouched by herds of feet. 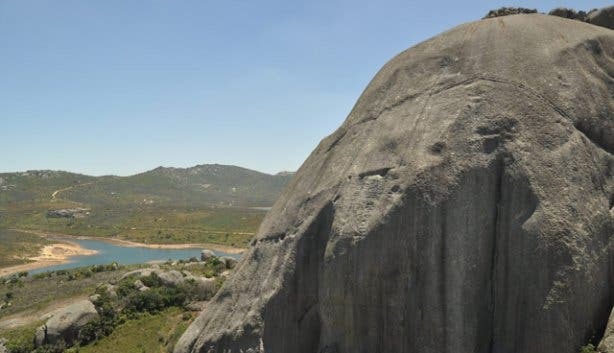 You can take a drive to the Taal Monument (a sculpture built in commemoration of the Afrikaans language), and hike the mountain from there. 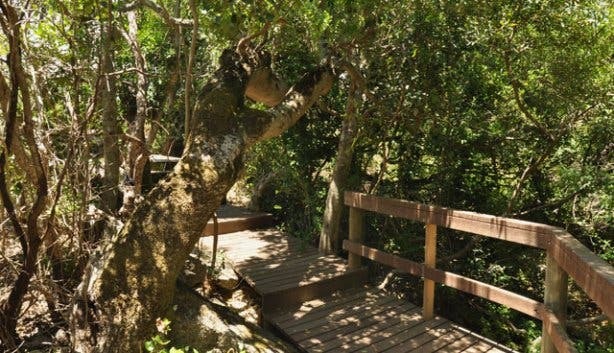 Traipse in the botanical gardens, find a rock to sit on and admire Paarl below, or have a braai at Krismis Kamp. Fauna: We saw a baboon on our walk, quite an unusual sighting for this part of the world. Also keep an eye out for birds of prey and many a scuttling lizard. Trivia: Interestingly, what makes Paarl so suited to shiraz production is the granite rich soil.